As Indian agent, forceful peacemaker and humanist, Maj. 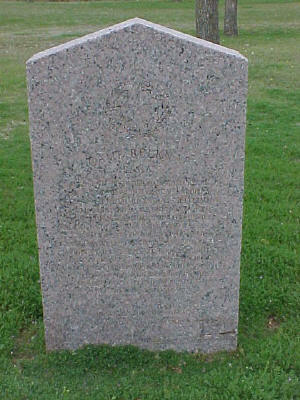 Neighbors had mode influence over Texas' Indians that any other man of his era, came to Texas in 1836. He served as Quartermaster in Texas army, 1839-41, while on Texas Ranger duty in San Antonio, 1842, he was taken as a prisoner of war to Mexico by Gen. Adrian Woll and spent 18 months in Perote Prison. Began his service to the Indians in 1845, as agent for Lipan-Apache and Tonkawa tries, he used field system of control, visiting Indian homes, learning a Red Man's way of life, improving living conditions, helping them to trade. He ably defended their rights, was counselor and friend and sought new homes for them, never faltering in commitment to their safety. As a Texas Commissioner in 1850 he organized El Paso Count, he was also a State Representative, 1851-1852, and a Presidential Elector in 1852. By the time of the Civil War, 1861-65, Texans knew the horrors of Indian warfare. Hostile tribes made a business of stealing horses, cattle, women and children. The paths they followed in the "Bright Comanche Moons" were marked by fires and ruin. The Tonkawa tribe, by contrast, sought friendship with Texans. The became valued allies in the Civil War, scouting against hostile Indians and watching for signs of Federal invasion. 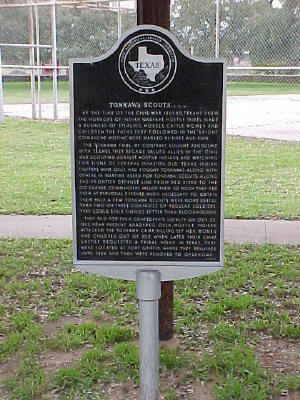 Old Texas Indian fighters, who once had fought Tonkawas along with others, in wartime asked for Tonkawa scouts. Along with the frontier defense line from Red River to the Rio Grande, commanders valued them so much the fed them at personal expense when necessary, to obtain their help. A few Tonkawa scouts were more useful than two or three companies of regular soldiers. They could stalk enemies better than bloodhounds. Reconstructed 1936 by the State of Texas with funds appropriated by the Federal Government to commemorate One Hundred Years of Texas Independence. The following committee contributed their time in history research and in the restoration of these ground. 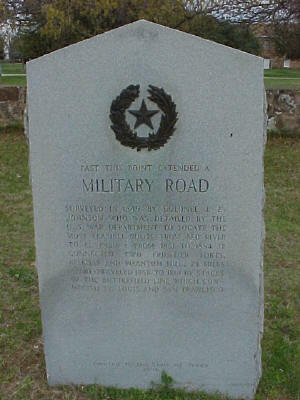 Established Nov. 1851 for the U.S. Army by Gen. Wm. G. Belknap and located by Cap't. R.B. Marcy. 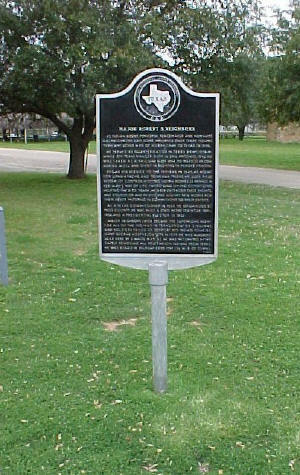 This post-one of the most important in Texas at the time was maintained by the U.S. Army until 1867 for the protection of early settlers and travelers. The following personnel occupied this fort from 1851 to 1867. 1851 - Ten companies of the 10th Infantry under command of Col. G. Loomis. 1852 - Five companies of the 5th Infantry under command of Col. G. Loomis. 1854 - Three companies of the 2nd Dragoons 87th Infantry. 1855 to 1857 - Two to Four companies of the 1st and 7th Infantry under command of Cap't. Brevet and Maj. G.R. Paul. 1858 - One company of the 1st Calvary and 1st Infantry under command of Cap't R.W. Johnson. 1987 - One company of the 6th Cavalry under command of First Lieut. G. Schreyer. Surveyed in 1849 by Colonel J. E. Johnson who was detailed by the U.S. War Department to locate the most feasible route from Red River to El Paso. From 1851 to 1854 it connected two frontier forts, Belknap and Phantom Hills, 73 miles apart. Traveled 1858 to 1861 by stages of the Butterfield live which connected St. Louis and San Francisco. Confederate frontier post Camp Belknap located this vicinity. Local soldiers determined to guard edge of settlement against Indian raids, Union invasion from Indian territory joined frontier Regiment of Texas Calvary and Rangers. Chain of posts from Red River to Rio Grande patrolled regiment. Concentrated vicinity this camp Spring 1863. Fought Comanche attack near Elm Creek 1864. Constantly looking for marauders, short on food supplies and ammunition, these Confederates effectively protected settlers and supply trains. Erected by the State of Texas, 1963.